The characters in this show are basically the inverse of characters like Desert Punk’s Mizuno Kanta and GS Mikami’s Yokoshima Tadao. While those guys are tight in the clutch and useless everywhere else, these guys are clever strategists who manage to screw up at the most critical juncture. I have an overall preference for the former apprach; it works better for all-around shows that mix comedy and drama. Still, the latter approach definitely works for comedy. Perhaps the best balancing act this show has done a skillful job maintaining is the dual nature of Don Valentino’s competence. On one hand, he’s clearly capable of gambits with a very high level of counterplanning. On the other hand, his gambits ultimately fail because of some small oversight. Usually, that oversight is something he couldn’t have reasonably predicted, but this time he dug his own pit trap too deep to climb out of with those stubby legs of his. This was made all the more entertaining that it took him 3 tries at escaping the forest, with a different one-liner each time, before he realized he was just as lost as the ones he had trapped. Soumei was eventually able to save them all, but you can bet that if he had been there from the start, he would have been just as stuck. 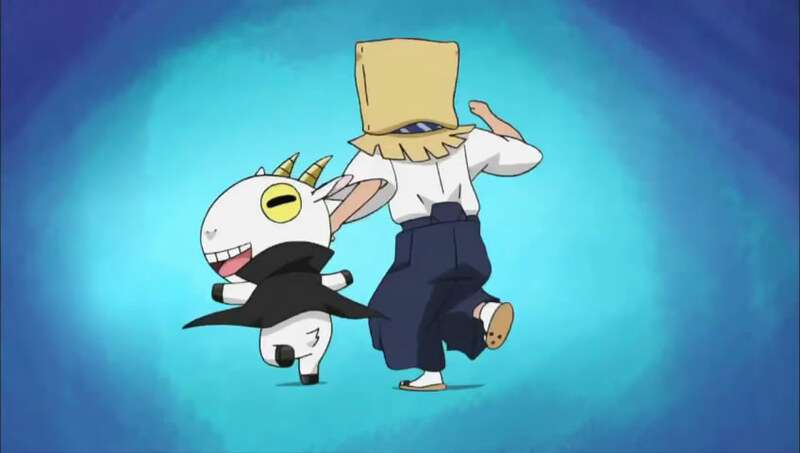 The first half of the episode, with the skit involving the goat park, was less interesting. I think it was a combination of the material being weaker and fewer characters being involved. The nature of the cast really requires them to be comically trying to best each other to be interesting, so it’s just not as fun to watch a skit that’s all about characters on the same side of the law. Fortunately, with the ending coming up, we’re set for the more traditional shenanigans and counter-shenanigans that this show excels at. This entry was posted in Anime, Finished and tagged Anime, Bumbling Villains, Cuticle Detective Inaba, First Reactions, Protagonist Thoroughly Outwitted by torisunanohokori. Bookmark the permalink.